Design is fully scalable to meet the needs of each care unit. A typical nurse is 168 cm. tall, 47 years old, has failing eyesight, and performs multiple tasks at once. Access to patient data is critical for them to provide effective patient care. 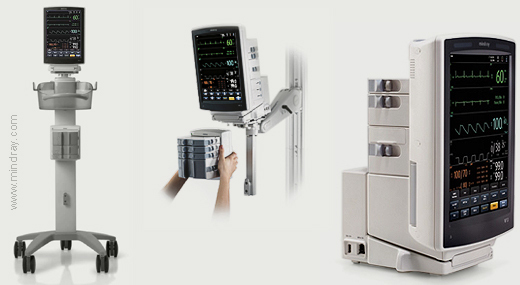 The V Series Patient Monitors are designed to deliver a modernized user interface that is consistent, predictable and intuitive, without information overload and unnecessary alarms, and easily accessible even in the most chaotic environments. They are the first to use a vertical display, which allows for more information to be displayed in a clear and easily readable format. 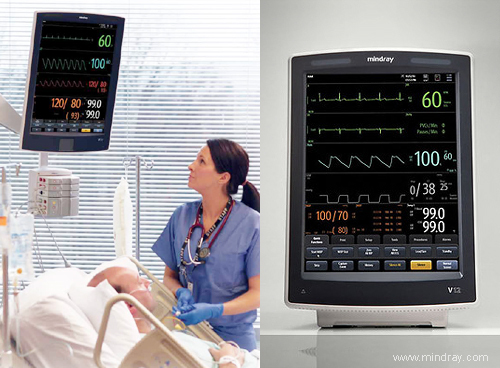 The V12 monitor, with integrated module bay, serves dual functions as both bedside and transport monitor without redressing patient cables. Dimensions: V12 239x 191x 348 mm. / V21 392x 191x 562 mm.